Fits perfectly, very good quality. Bought this when the band was having a rough time, always replied to my e-mails and were very friendly and concerned. Sjukt snygg och tjejen blev strålande glad. I got this shirt for my birthday and it's the best present ever! Looks very awesome, and the colours are great. Very good quality. Love it! I love this shirt. It fits perfect and the quality is great. Ordered this shirt in medium size, turned out a bit tight but once you have it on for an hour or so it fits like a normal medium size. Colors are as bright as on the picture (love it! ), white is a bit see through but the print covers the most important parts ;). Was a little smaller than I thought, but I solved it with making it to a, which I love. And after around 4 - 5 washes, it still looks excactly the same as when I bought it! Thumbs up! Very fast shipping from Sweden to Belgium for this beautiful lady shirt! Recommended to every Crashdiet fans!!! 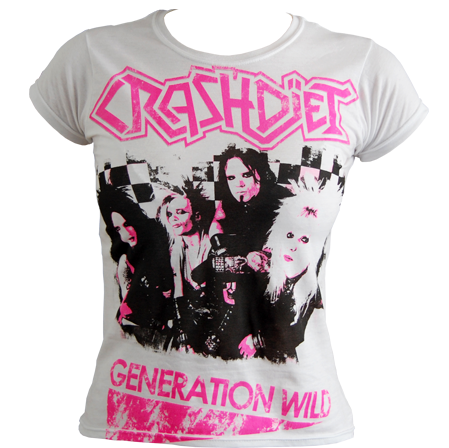 An Awesome Crashdiet top! Always true to size & very well made. I'm loving the pink logo's on the back too! WILD WORK!!! Excellent service and fast delivery. The pink generation wild lady t-shirt has a nice picture and lovely colours. I'm sure it will suit perfectly (it´s a present for my girlfriend that i didn't give it to her yet...i'm sure she'll love it ;). It was my first purchase and i'm thinking of more. Thankx guys!! You're the best!! Keep rrrocking!!! I purchased my t-shirt and it was posted the next day!! Thank you also for my stickers and guitar pick that were sent with it!! Will definitely buy from here again!! Excellent quality t shirt, it fits perfectly! Great colour too! Love the shirt, it fits perfectly and has a great quality! Bought it as a present for a friend. She totally loves it! this t-shirt is amazingly bright and glam, straight into your face! wow! love it! I ordered a size M ladies.Japanese is 5 feet 4.57 inches, was a good size.Good color, good comfort. Pink is so cute, girls will absolutely recommend! Bought this one for a friend n she's totally in love with it! Fits perfect, amazing colours, just everything! Thanxxx! Delievery was prompt and the shirt exellent quality. It looks gorgeous! I love this T-Shirt. Love it! The quality is amazing. Girlfriend absolutely loves this t-shirt, looks really good on her too! nice colors-and nice quality! the print is not that "hard" as we know from some bandshirts-so its really nice to wear!!! I absolutely love this! The tshirt is great quailty, it feels really nice to wear and fits perfectly (A size large really is just a normal large! )Postage was also extremely fast (even all the way to Australia!) 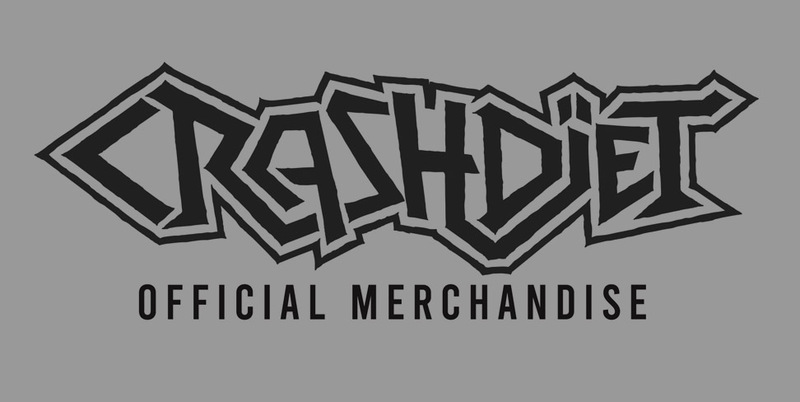 I can't wait to buy more from the Crashdiet store! This shirt was my first Crashdïet one, i bought when they were in Brazil... Fits perfectly and the print is just great! An awesome shirt, i love the colours and the back is great too! The picture is really nice, i loovee it! I really really love this girlie! It fits just perfectly and it have already become one of my favourite shirts! The colours with the bandprint -so cool! I bought this t-shirt in May. In three days was at my house in Spain. They resolved my doubts about the size. The t-shirt is wonderful Congratulations Crashdiet!!!!!!!!!! My sister really love this t-shirt and she ware it all the time. She likes the design and the colouring. I love this shirt! The design and colouring look awesome. The Gildan Soft Style branded Tshirt it is printed on fits better and is more comfortable than most other girls shirts. It also shipped much quicker than I expected to Australia! Bought it too at the Gothenburg gig. My friend is so happy to wear it. It's glam and class! Lovely! Fantastic quality t-shirt. No loose threads and neat seam work. The shipping was also really good and a very friendly service too. Size is smaller than I expected, so take a bigger than normally. Lovely but I don't really like boys' pink faces.